The pool at Maui's Hotel Wailea was redone while the hotel's suites were being overhauled. Photograph by Linny Morris. The pool at Maui’s Hotel Wailea was redone while the hotel’s suites were being overhauled. Photograph by Linny Morris. If you’re looking for an island escape or a vineyard getaway, one of these five new hotels, scattered throughout the West, should fit the bill. 1. 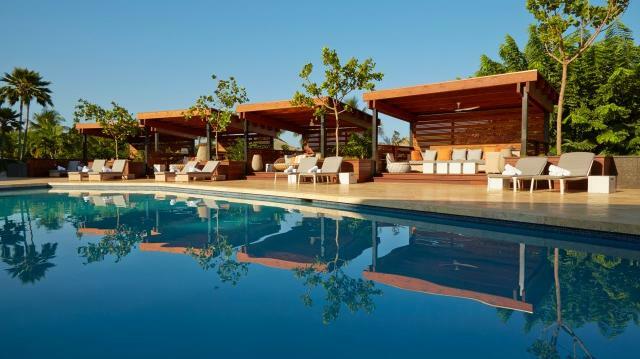 Hotel Wailea, Maui, HIHawaii packs a lot into its eight main islands—but not, till this year, a hotel that met the, let’s say, picky admission criteria of France’s Relais & Châteaux organization. Formerly a private resort for Japanese high rollers, Maui’s 72-suite Hotel Wailea (555 Kaukahi St.) opened to regular guests after it changed hands in 2008. Its drab decor, however, kept it under everyone’s radar. Thanks to a complete overhaul—Sub-Zero refrigerators and polished oak floors—the 15-acre hillside property has joined the likes of Meadowood and Dunton Hot Springs in the rarefied R&C stable. From $420. View towards the ocean from a suite at the Hotel Wailea. Photograph by Travis Rowan. This bedroom at the Hotel Wailea gets late-afternoon light. Photograph courtesy of the hotel. 2. The Landsby, Solvang, CAAlthough we may picture half-timbered houses and Little Mermaids when we think of Denmark, the country is equally famous for modern design. So this stylish 41-room hotel (1575 Mission Dr.) actually makes perfect sense in a storybook “Danish” village—and it couldn’t be better located for exploring Solvang’s 18 tasting rooms and the wineries of the surrounding Santa Ynez Valley. From $225. The lobby at the Landsby, in Solvang. Photograph by David Tsay. At the Landsby, a “premium balcony queen” room. Photograph by David Tsay. A “deluxe king” at the Landsby. Photograph by David Tsay. 3. The Lodges on Vashon, Vashon, WARainy, remote locales like Vashon Island often prompt the designers of new hotels to think outside the box. Make that inside the box. And by box, we mean prefabricated modules, constructed off-site and then trucked (lighting, finishes, and even bathroom sinks already installed) to the final location. In August, the Lodges on Vashon (17205 Vashon Highway SW) open at the north end of Vashon town: 16 stand-alone one- or two-bedroom units (left) with gas fireplaces, kitchenettes, and heated floors. From $190. The all-prefab Lodges on Vashon. Image courtesy of the resort. Calistoga’s Brannan Cottage Inn dates back to the mid-1800s. Photograph courtesy of the inn. Last but not least are two recently renovated Victorian hotels that bookend the sweet spot of Napa Valley wine country—that is, the stretch of State 29 between, to the south, the city of Napa itself and, to the north, the funky mud-bath town of Calistoga. At the Senza, some rooms face a neighboring vineyard. Photograph courtesy of the hotel. The first, the eight-room Parker Mansion (circa 1870), serves as a cool marble-and-taupe nucleus of an otherwise modern 41-room resort called Senza (4066 Howard Ln. ), owned by the family behind Hall Wines and set right where the city of Napa’s cul-de-sacs start giving way to vineyards. From $239. A “historic queen” room at the Brannan Cottage Inn. Photograph courtesy of the inn. The second, a gingerbread villa called the Brannan Cottage Inn (109 Wappo Ave.), occupies one of the original cottages that Calistoga’s founder, the freewheeling Samuel Brannan, built for his hot-springs resort in 1860. Along with the appropriate antiques, its six bedrooms are furnished with Illy espresso machines, flat-screen TVs, and Roku boxes. (In fact, this year the hotel won a Sunset Travel Award for its renovation.) The buccaneers of today should feel right at home. From $299.